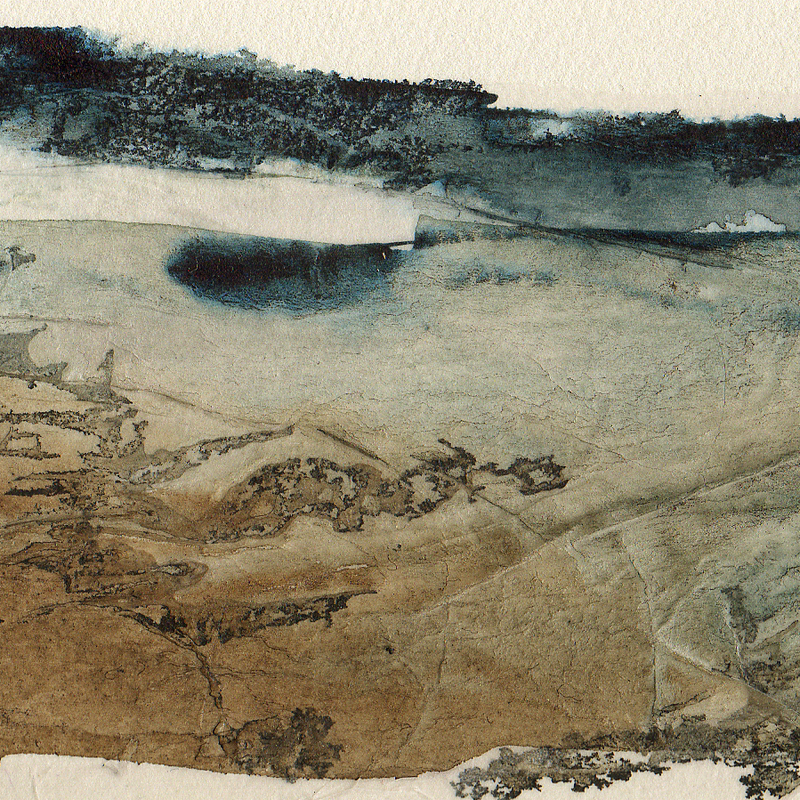 A detail of another recent ink and tissue experimental piece (shown in full below), to show the lovely way the ink runs into the wrinkles and creases in this method, suggesting natural features. This detail is roughly actual size. (Hopefully this one will show an enlarged view when clicked on! I’ve been having difficulty getting this aspect to work when using the ‘shortcut’ New Post facility in WordPress). I am so excited by this way of working! This entry was posted in acrylics, landscape, Mixed media and tagged abstract, acrylic ink, coast, landscape, mixed-media, norfolk, painting, sea, texture, tissue by mari french. Bookmark the permalink. I think it is part of the quality of using such media – it is to an extent ‘uncontrollable’ in it’s creation (which I LOVE) but the thought of selling one, for it to degrade – is less appealing. I’m quite interested in the process as an experiment if nothing else. I’m sure there is info out there (must use Goodle – fu!) and it’s certainly worth a blog post! Hmmm… thanks Elaine, you’ve given me something to think about. I do need to check out archival tissue paper and whether that discolours. Most of what I’ve produced recently is just experimental, although I do have one I’m going to be rather upset about if it changes too much! Damn! I need to source something like rice paper – one that is very fine and ‘crinkle-able'(!) as an alternative to tissue. I actually liked the idea of using something that would normally be thrown away, but as you say, the thought of it changing colour on someone’s wall is not appealing! I love your experiments with tissue and watercolour, I think they have great potential and I am looking forward to seeing more in the future. You might be interested to try Lokta paper as it has small bark inclusions which add to the texture. Many thanks Ian, good to get your feedback. I’ll check out the Lokta paper – it sounds interesting. I’m trying to get hold of natural coloured tissue paper (as opposed to pure white as most available tissue is, other than coloured which I definitely don’t want). If you spot any please let me know, won’t you.